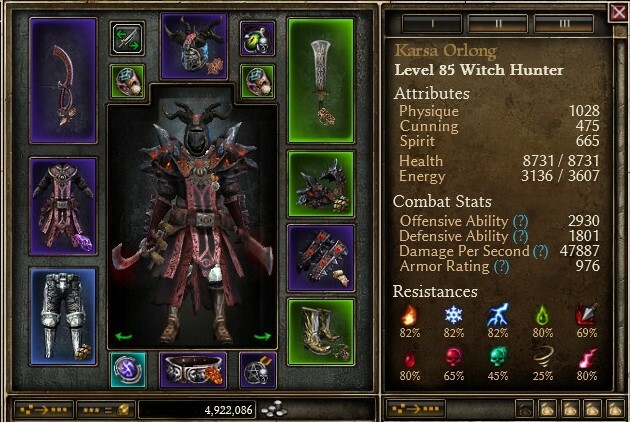 last but not least, I hereby present my dual wielding Witch Hunter build to you folks. 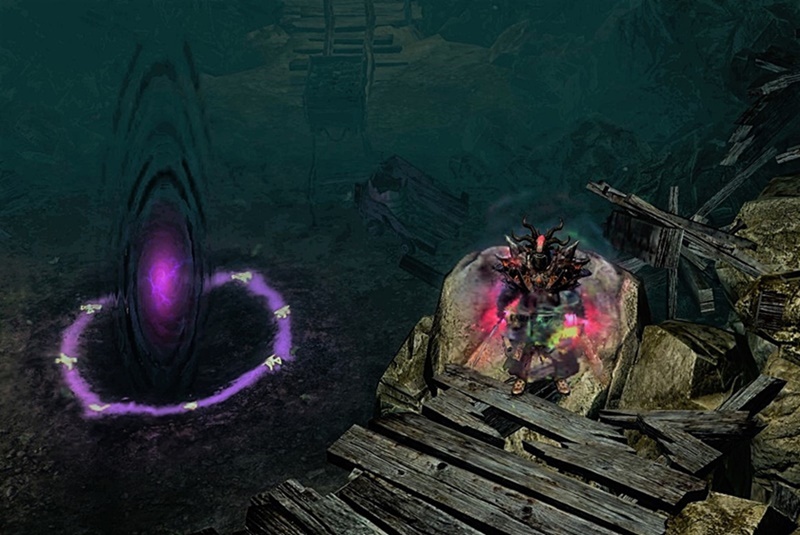 Based on the three Damage Types Chaos, Acid and Vitality, this toon can clear Ultimate without even breaking a sweat and Nemesis bow down as soon as they spot him approaching. This is a dual wielding Witch Hunter build, not making use of any Set Bonuses, relying heavily on ADCTH and therefor on the damage it inflicts and Attack Speed. This grants high survivability and high damage at the same time, resulting in a very fluid and satisfying gameplay. This results in this build being easy to gear up for and very approachable for new players. A good chunk of the items can be crafted or replaced by other, optional Gear (see below). With Abominable Might active you inflict about 63k paper DPS. Without, you will sit around 47k DPS, which is plenty. Additionaly, your procs will hit hard and your WPS combined with Nidalla's Hidden Hand result in guaranteed high damage output. The OA can be pushed to about 3200 with alternative gear, no problem. But I run this one with about 2900 OA and capped Attack Speed and I wanted to present you a build without too many godly rolled MIs. Sitting only at around 1800 DA and 9k HP, you are squishy on paper, but as soon as you hit a mob, you won't die (except Mad Queen). With other Augments and Crossroad's +%HP Devotion Points you can easily push your HP up to ~10k. Resist Reduction is served by Devotion Procs and Skills. Since we deal Chaos, Vitality and Acid damage you will have the maximum benefit out of all your RR skills. Together with a crafted Master's Spellblade, you will have -90 to -100 RR on all three Damage Types up your sleeves. As Auto Attack Replacer we're using Beronath's Fury from the Shard of Beronath Component. Both Nightblade and Occultist don't offer an Auto Attack Replacer out of the box, so we need this bad boy (must have). Aspect of the Guardian offers much needed 100% Poison and Acid Resistance and 12% Physical Resistance; overcapped Possession grants additional 14% Reduced Overall Damage. With gear, you will sit at 18% Physical Resistance and overcapped Elemental Resistances, which can easily be pushed even higher with optional gear. Mark of The Apostate grants a 2 sec 50% Fumble & Impaired Aim proc, resulting in you not being hit too much, as well as some juicy Poison Damage. Your Weapon & Devotion procs make many of the trash mobs die just by running around them. I've been experimenting with Belgothian's Shears and it inflicts definately more DPS than Whirling Death. Imo, you need an AOE WPS with this build. Fevered Rage from Bloody Pox (deskill 2 Points out of BS) is also viable, but the risk does not result in significant better killing speed. Cast Curse of Frailty on the mobs you want to approach, Shadow Strike in and LMB everything until corpses pile up on the floor. Don't forget to cast PB and BoD to keep 100% uptime on both. Against Nemesis and other hard Boss Mobs, cast Gaze of Beronath for -100 OA debuff and Solael's Flame. Wield them down after. Cast BB if neccessary (won't happen 99% of the time). Keep in mind, stun and freeze effects are your main enemies. As soon as you can't hit an enemy you will die rather quickly. Due to your low HP pool and DA, your Healthbar will jump a lot. Deal with it. Mad Queen: Well, I don't recommend fighting her with this build, to be honest. It is a chore. Your procs and pure DPS together with very low DA will kill you within seconds. If you really want to fight her, equip MoD, ditch Panther Devotion in favor of Turtle and kite her, as soon as her Aura pops. Crucible: You can finish Challenger in record times, but Gladiator is another level. I finished Gladiator with this build, but you will die. A lot. If you don't prepare and switch Devotions/Gear, don't even bother, or be frustrated. If you want to clear Gladiator Crucible reliably as a Chaos/Vit DW WH, try gomagon_t's Witch Hunter with different gear and Devotions. This is a very potent and fast Vanilla/Challenger farming build, not a (slightly) Gladiator master. This build is very versatile gearwise. Almost every item can be replaced by at least 2 optional ones, except Master's Spellblade. The alternatives may result in a less efficient gameplay though. You can shift this DW WH just by gearing into more of a Acid/Poison (with Lethal Assault) or Vitality Damage dealing build. Always try to keep your Attack Speed at at least 190% and try to cap your Resistances. With some nice MIs, you can easily cap them out and have even more OA/DA than my current recommended setup. I just didn't want to put those rare MIs into my recommended gear, because they can be very hard to grind and find (even though I have plenty). Cronley's Signets and Viloth's Rings are rather easy to farm, compared to nice Sect Pants and Benn'Jahr's Pauldrons imo. Try to craft yourself some nice rare boots for even more Stun Resistance! For example, check out Thrasheur's Chaos Vitality dw Witch Hunter. To sum it up, this is not a build that can clear Gladiator without any stress (current top of all builds are Casters and tanky Caster hybrids with shield for that matter), but it is well rounded, with high DPS (better clearspeed than any Sword & Board) and so much fun to play with. You will be pleased with the playstyle. Give it a try! Shoutouts to Chthon, JoV, Thrasheur, TomoDaK, Superfluff, Drizzto and jajaja for providing inspiration/help and making this forum a nice place to be. Last edited by Jägermeister; 07-18-2017 at 04:40 PM. There are two main options while leveling. You can use Amarasta's Blade Burst + Lethal Assault (which I did) or Dreeg's Evil Eye Line to level up to level 50. At level 55 you can craft Shard of Beronath, which is our main attack tool, as it replaces your Auto Attacks. After having SoB applied to one of your weapons, you can skill out of ABB or DEE. That should be at the end of Normal / beginning of Elite. Not having SoB, you should stick with ABB+LE on your left mousebutton (skill out of DEE now). I will now focus on the ABB route. Bind Flame Torrent to ABB and Twin Fangs to a WPS early on. I usually don't bother playing Veteran. The Items you find will be replaced later on anyway and its much faster/safer to play just on Normal. The missing XP can be grinded up through some BoC Runs at the end of Normal. Start with Nightblade Mastery. Put 1 Point into Dual Blades and one into ABB. On level 2, put 1 point into Veil of Shadows and two into you Mastery Bar. From there on, I like a 1-2 scheme in skillpoint distribution. Put one point into a skill and two into your Mastery Bar. This way, you will be close to 50/50 on your Mastery Bars at level 50. This scheme can be broken out of occasionally, to bring certain skills to 5. I usually leave most skills at 5, until I've finished the Mastery Bars. With 5 Points put into your NB Mastery Bar, skill into PB and BS. Pneumatic Burst is very helpfull throughout the game and especially in the early levels, as a healing mechanic. Start equipping two weapons as early as possible! I recommend to start dual wielding around level 5. As I've recently seen a Streamer doing his first playthrough with a WH, not using Pneumatic Burst 24/7, I want to quickly point out, that PB should be up and running all the time! The same goes with Blood of Dreeg. At level 10, Take Occultist as your second Mastery. Put 5 Points into your Mastery Bar, one into CoF and 5 into Solael's Witchfire. Go on putting Points into you Mastery Bars. Take Lethal Assault, Amarasta's Quick Cut and Night's Chill up to level 5 on the way asap. Leave SS and Shadow Dance at one. Put two Points into Vulnerability. While leveling, always try to explore the whole map for maximum XP gain and chances to find rare items. Try equipping Weapons and Jewelry with +OA, +AS and Attack Damage converted to Health, as well as some Resistances on you Jewelry. Even some yellow Rings and Amulets can be very powerfull with the right rolls. I also like wearing a Medal with + %XP gain. At level 18, you can craft yourself a Calamity Relic. It hits pretty hard with its shotgun mechanic. I usually keep Calamity on up until level 35, when you can craft Slaughter. Another option is crafting a Mistborn Talisman Relic at level 25 and use Troll Rage as your Auto Attack Replacer. It hits pretty hard and can be combined with Lethal Assault (LA's 4 sec buff applies to all of your attacks). If you Troll Rage along, bind Flame Torrent to it! Afterwards, at level 35, you can decide whether to switch to the Slaughter Relic or to keep on Troll Raging until you can craft a Shard of Beronath at level 55. Slaughter provides the better stats, but is a bit expensive to craft. Now a major tip for players, already able to craft Omen. Try to craft yourself two of these bad boys at level 25 as fast as possible. Those deal so much damage and the Proc is very powerful. Those can possibly carry you up until level 50, if you are unlucky and don't find some nicely rolled Weapons with fast AS. Try to find some gear with + Cunning, if you are lacking the stats to wear those. Also, start farming Cronley for a few times to find one or two nicely rolled Cronley's Signets. Go on passing through the game while exploring every corner. Always try to equip the best rolled Armor and keep yourself alive with PB and maybe some ADCTH on your Weapons/Jewelry (with Omen BiS). Start keeping an eye on your Resistances. At level 35, check the Faction Vendors available to you, to possibly buy superior Items and Augments. Craft yourself a Rhowari Cord (Belt Armor) at the Blacksmith, if possible. Near the end of your first playthrough, you can start shifting some skillpoints, if needed. You could skill out of a WPS and put those points into Lethal Assault or PB, for example. At level 45, having found the Blueprint, you can craft an Adept's Spellblade at the Blacksmith. Try to craft yourself an Adept's Spellblade of the Abyss or Plaguebearer's (I recommend doing that at level 46, this is when the Suffix can roll with higher stats). Replace one Omen with it. Reaching level 50, if you are an experienced player, equip some Legendary items. If this is your first playthrough, compare the gear available at the Faction Vendors with your gear again and try to stack up some nice rares/epics. Also check the Blacksmith for new craftable stuff. For example, a nice temporary level 50 Amulet is the Avarice of Androneus. Having finished the game and all the Sidequests (including Hidden Path) on Normal you should sit at around level 55. If not, grind some XP at BoC or SoT. At level 55, craft yourself the Shard of Beronath Component asap. Not having the Blueprint, you can stick to ABB+LE and do some Treasure Trove Runs. Here you can see a possible run in the second half of the video. Other conveniant Treasure Trove Runs are Kilrian Runs (also helpful to find the Component Parts of Kilrian's Shattered Soul), the first two SoT levels before the gate and the Treasure Troves at Tyrant's Hold. If this is your first Character, you will have to grind some Enemies or farming routes to get the best results. Deal with it, it's an ARPG. After having Shard of Beronath applied to one of your Weapons, skill out of ABB+LE in favor of some points into your Mastery Bar or other Skills. After level 50, try to rush NB Mastery to 50/50 asap to skill into Execution. The skill deals tons of damage, especially combined with high AS. Entering Elite, just go on playing and shredding through your Enemies. Pump points into Vulnerability for the -RR and work your way up to my recommended level 85 skill distribution. Check your Resistances, they mustn't be too low from now on. Use Augments/Skills and whatever gear you find to maintain them on a high level. At level 65, you can craft yourself an Empowered Omen and a Master's Spellblade. Get the Master's Spellblade asap and the Empowered Omen if neccessary. Remember, the best of the Abyss Suffix can be crafted at level 74. That's why you don't want to invest too many ressources at level 65. Entering Ultimate, you should max out your Elemental Resistances and work your way up to my recommended Resis as fast as possible. If you are a new player, you might want to farm Elite stuff for a while. But I'd recommend playing at Ultimate Difficulty, even without any of my recommended or alternative gear. The droprate is far higher at Ultimate and you should be doing fine most of the time. Always remember, dying is not a big problem (not playing HC, that is). Last edited by Jägermeister; 05-05-2017 at 06:06 AM. Is it the same build you've been giving us sneak previews of? Exactly. But I wasn't sure, if it's worth posting, due to many dw WH builds popping up in the past weeks. But I was bored, so here we go. Thanks! I finally had the time and courage to write it down and post it. Was about time! I linked to your dw WH build now, too. Just one of many things I forgot, I think. Thanks for posting this Jägermeister - I've been leveling one and it's been a breeze! Hope you'll enjoy it for a long time. Np, but your older version was still very viable. There might be a lot of guys out there, not having a well rolled Master's Spellblade or wanting to try something different. Btw., can you reliably clear MQ with your setup in a decent time?